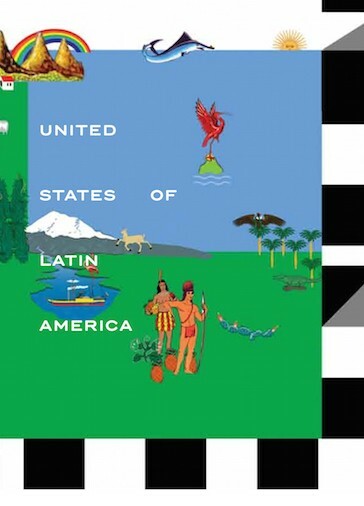 This entry was included in the glossary section of the publication accompanying the exhibition "United States of Latin America" (2015), co-curated by Jens Hoffmann and Pablo León de la Barra for the Museum of Contemporary Art in Detroit and made in collaboration with Kadist Art Foundation. Spanglish: a term that combines the words Spanish and English to denote the mixture of two languages, and, as such, the encounter and co-existence of two cultures. Spanglish is considered a linguistic development made by Hispanics in the United States of America. Spanglish is also manifested in vocabulary and colloquialisms used by Latin Americans whose country of origin has had a significant presence of English-speakers. It is associated to immigrant culture in the USA, as it is to American colonization. The Puerto Rican writer Salvador Tió is attributed for having coined the term "espanglish" in the late 1940s. Notice that in this version the two-word composite uses the proper, native spelling of the two languages it combines: Español and English. The more commonly used word is Spanglish, however, were both languages are subjugated to English. This is a paradox, given that Tió used the term espanglish and also inglañol, as part of a wider critique on the depreciation of Spanish over English. A particularity of Spanglish is its grammatically incorrect but literally appropriate translation of terms, and its semantic extension of one language to the other, where a word of one language is spelled out or pronounced similarly to another language, while its meaning may actually differ. At times, the term "pocho" is interchangeable to Spanglish, but the former more generally refers to a subject rather than a language. For example, pocho has been used to refer to Mexican immigrants in the United States, particularly working class, who took on English as a Second Language and heedlessly mix vocabulary of these languages in their speech. In the field of visual arts, the artist and writer Luis Camnitzer theorized on Spanglish Art in his essay "Wonderbread," published in 1988, during a period now characterized as the Culture Wars in the USA. For the author, Spanglish Art conceptually departed from one culture but was formally experienced, and to a large extent created, in and for another culture. Camnitzer’s essay explores work by Hispanic artists in the US that, in their form and content over-characterized subject positioning by visually emphasizing national symbols as biographical markers.